Gifted children, who asks bigger questions and pursue more advanced interests, often feel alienated in the school system. The Polish Children’s Fund addresses this problem by offering scholarships for talented pre-university students. Piotr Migdał has been a part of it, both as a student and as a supervisor. There is a belief that talented children do not need any help. On the contrary, the exceptionally gifted have special educational needs. Their interests, and questions, are typically beyond knowledge of their parents and teachers, however well intentioned. Moreover, often such students feel alienated – as their passion for, say, molecular biology of mitochondria is not nearly as common as for sports or blockbuster movies. Polish Children’s Fund (pl: Krajowy Fundusz na rzecz Dzieci) is an NGO addressing this need. It offers yearly scholarships for gifted pre-university students, around 500 each year. However, instead of giving money it provides an opportunity to take part in scientific and artistic camps, free of charge. Most of the camps are specialistic (e.g. algorithmics or experimental physics), involving participation in research projects led by scientists. There is also one main, multidisciplinary camp, mixing high-school students with interests ranging from mathematics, through chemistry, to history and literature. It gives opportunity to taste other disciplines, participate in discussions on topics of general interest, and interact with peers. 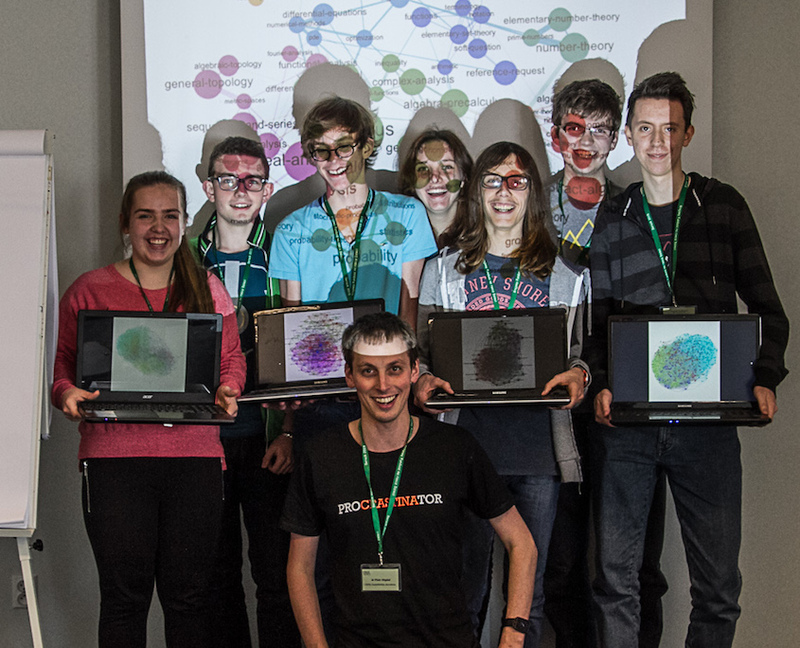 After “complex networks are simple” workshop on the multidisciplinary camp in 2015. 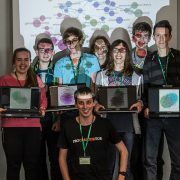 Participants hold their graph visualization of Facebook networks, in Gephi. I was a fellow in during my two last years of high-school, and it was a wonderful, life-changing experience. I remember what I said to my mother after going back from my first camp “There are so many people like me!”. Now, it’s been 10 years during which I’ve been volunteering as a tutor. Partly because I consider it an important mission for society. But mostly because I really love it – as it takes a spark to ignite their curiosity for a long time. And I like questions I have never anticipated! Or, as Maria Mach, KFnrD director, likes to put it: students are like plants in a garden, with development being a gradual process. We should provide a fertile environment, but we cannot grow for them. From what I witnessed, intellectual growth is not linear. Not all people develop their talents early and many whizz kids become “smart but not outstanding” adults. Yet, investing in “the best” is crucial – for them and for society. Qualification based on extracurricular activities and interests (including scientific projects, books, scientific olympiads) but not school grades (we even don’t ask for them). Lectures and workshops based on volunteering – by students and professors alike. Fellowship with no money but 100% reimbursement (accessible regardless of child’s material situation). Peer contact between people at various stages of development, fellows and tutors alike. Research projects in real laboratories. A data science freelancer (machine learning, interactive visualizations, trainings) holding PhD in quantum physics. He organized independent events such as camps for gifted high school students and an unconference series Offtopicarium; now working on a quantum game. In Canada there is the SHAD http://www.shad.ca/, they are a charity organizing a summer programme for exceptional high school students.